Much of astrology is about order. The sequence of the signs, the arrangement of planets in the houses, the different divisions of 360 degrees to form the aspects, and the assignment of the elements and modalities to each sign show this. Another way that astrology shows order is by the rulership assignments. I use the seven classical planets: the Sun, the Moon, Mercury, Venus, Mars, Jupiter and Saturn only when discussing sign rulership and dignity. The outer planets, Uranus, Neptune and Pluto were discovered much more recently and do not have the thousands of years of astrological study behind them to lend them credence within the system of rulerships and essential dignities. This does not mean that the modern planets should not be used – merely that they have no place in the scheme of rulerships and essential dignities that I prefer. For example, the meanings we attribute to the planet Uranus may have many similarities to the sign Aquarius, but it does not rule Aquarius – Saturn does. A planet operates very well and clearly in a chart when it high in essential dignity. The essential dignities are as follows: domicile rulership, exaltation, triplicity, term and face. I use the term domicile rulership to avoid confusion with other types of rulership. There are also essential debilities called detriment and fall. A planet that lacks any essential dignity is known as peregrine. Before going into the other types of essential dignity, we will focus on domicile rulership. When a planet is in its domicile sign (sometimes called its own “House” in older texts, thereby adding to the confusion) it is in a very comfortable place and works clearly and as one would expect it to act by its nature. A planet is comfortable in its own home. Using classical domicile rulerships, the Sun rules Leo, the Moon rules Cancer, Mercury rules Virgo and Gemini, Venus rules Libra and Taurus, Mars rules Scorpio and Aries, Jupiter rules Sagittarius and Pisces, and Saturn rules Capricorn and Aquarius. You’ll find that all the bodies except the Sun and Moon rule two signs, one masculine sign and one feminine sign. Also notice that if a planet rules an air sign in the masculine expression, it rules an earth sign in the feminine; and if it rules a fire sign in the masculine, it rules a water sign in the feminine. Moving on to the other types of essential dignities, we first come to exaltation. Planets are exalted as follows: Sun in Aries, Moon in Taurus, Jupiter in Cancer, Mercury in Virgo (Which it also rules), Saturn in Libra, Mars in Capricorn and Venus in Pisces. Two additional exaltations are listed: The Moon’s North Node in Gemini and the South Node in Sagittarius. A planet in exaltation is very strong, but acts much more independently than one in it’s own sign. Being in exaltation allows to planet to express itself strongly and it is the “honored guest” rather than the resident of the home. Thus, Venus in Pisces is the true romantic, and Mars in Capricorn is the driven achiever. The triplicities differ depending on whether the chart is diurnal (day) or nocturnal (night), that is whether the Sun is above or below the horizon in the chart. The triplicities of the elements are as follows: Fire – Sun diurnally and Jupiter nocturnally, Earth – Venus diurnally and Moon nocturnally, Air – Saturn diurnally and Mercury nocturnally, Water – Mars diurnally and nocturnally. Mars rules the water triplicity both diurnally and nocturnally because its fiery nature is best tempered by Water. The most complex of the essential dignities are the terms, in which each sign is divided into five unequal portions, each ruled by a different planet. This is a weaker dignity than domicile, exaltation or triplicity, but still important in assessing the relative strengths of the planets in a chart. Please refer to the table below for the exact definition of the terms. There are also the faces or decanates, which are also listed on the table. These are weaker than the terms and are equal divisions of ten degrees for each sign. If a planet is only dignified by face, it is sometimes said to be at its last gasp. William Lilly devised a point-based system to find the relative strengths of the planets. He assigns five points to a planet in its own sign, four points if in its exaltation, three points if in its triplicity, two points if in its own term and one point if in its own face. He also subtracted five points for a planet in its detriment or if peregrine and subtracted four points if in its fall. Basically, detriment is the sign opposite the sign of rulership and fall is the sign opposite the exaltation. A peregrine planet, one with no essential dignity, operates as a loose cannon. One way of explaining it is that a peregrine planet doesn’t want to be itself; it wants to act as the planet that is the domicile ruler of the sign it is in. And it fails miserably. Not due to weakness, but do to unsuitability. I first heard of this way of looking at peregrine planets from Rob Hand in a lecture at ISAR 2000, and I have been describing them that way ever since. Now all this information is well and good, but how do we go about using it? 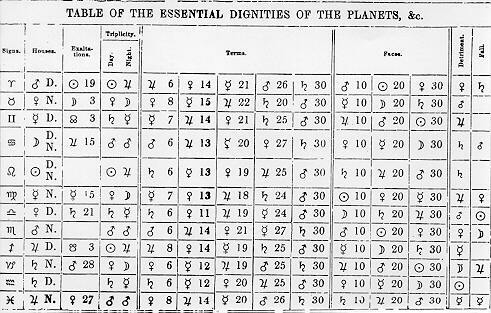 Using dignities can help us find the pivotal planets in a chart in several ways. They are basic building blocks that work with other techniques to give a fuller, deeper and more meaningful chart interpretation. A simple way we can do this is by using Lilly’s point system detailed above to find out which planets in a chart are the most dignified. I find that a highly dignified planet in a chart is very important in many areas of chart delineation. A highly dignified planet can be useful in pointing out the client’s potential strengths, career possibilities, and inclinations. For example, in my own chart the three planets highest in points in Lilly’s system are Jupiter, Mars and Saturn. The three longest-lived careers I’ve had are acting, the military, and astrology. Many astrology programs will calculate Lilly points. Another way we can use dignities and rulers to get to the bottom of chart is by dispositor relationships. The use of dispositors ties the chart together and leads us to the base from which the native acts. The way I use dispositors is to link planets by domicile rulership and reduce the chart to the one or more planets that form the essence of the chart’s expression. You can use dispositors easily just by following the chain of rulerships through the chart until you reach a dead end, which I refer to as the chart root. There are different kinds of chart roots that I talk about when dealing with dispositors: final dispositors, multiple dispositors, mutual receptions, multiple receptions and mixed dispositor/reception. A final dispositor occurs when there is only one planet in its own domicile and there are no mutual or multiple receptions by domicile. A final dispositor is the clearest cut of the chart roots. All other planets, angles and house cups will eventually make their way back to the final dispositor. If we were to think of the chart roots as the government of the chart, the final dispositor is dictatorial. Everything has to go through the “dictator.” This is where all the decisions are made. Bob Dylan’s chart, with only Mercury in the sign of its domicile Gemini, is an example of a chart with a final dispositor. Multiple dispositors occur when there are two or more planets in signs that they rule by domicile. Depending on the number of planets in their own signs, the governmental style would be a partnership, triumvirate, quadripartite, or any higher multiple thereof. Since different planets, houses and angles would dispose to the different planets in their own signs, there is no one dictator the chart turns to when it needs something done. Take, for example, a chart that has Saturn in Capricorn and Jupiter in Sagittarius. The native would act on some things from a Saturn basis and others from a Jupiter basis. Mutual Receptions occur when two planets are in each other’s domicile sign. This means the chart winds down to a seesaw contest between the two planets in mutual reception. The governmental style here is one of two branches of government with equal powers over all areas that bicker back and forth about the best action to take. Ted Turner’s chart is an example of one that disposes to a Mutual Reception, with Venus in Mars’ domicile, Scorpio; and Mars in Venus’s domicile, Libra. Three or more planets involved in the same kind of “closed circuit” as a mutual reception I call a multiple reception. And example of this would be a chart with the Sun in Cancer, Moon in Gemini and Mercury in Leo. Mercury is in the Sun’s domicile, the Sun is in the Moon’s domicile, the Moon is in Mercury’s domicile, Mercury is in the Sun’s domicile, etc. This would act like a “government” of three or more branches, with the resultant balancing act between the branches. Mixed dispositors happen when you have both a planet in its own sign and two or more planets in a reception relationship. An example would be a chart with Mercury in Virgo, which it rules by Domicile, and Sun in Libra and Venus in Leo. Some planets and points in the chart would ultimately dispose to Mercury, but others would be caught in the Sun/Venus Mutual Reception closed circuit. To show these different types of rulership patterns, I draw lines on the paper copy of the chart from point to point, showing the relationships between planets, angles and intermediate house cusps. I refer to the resulting diagram as The Web of Rulerships. Bob Dylan’s chart has Mercury as final dispositor. Everything in his chart eventually harks back to his 7th House Mercury. His whole being is colored by this placement. Mercury aspects Neptune and the Moon’s North Node by square, trines his Midheaven and is opposite the Ascendant. Here we see someone who communicates an idealistic message to the outside world, but who sometimes has difficulty getting his message across. Ted Turner’s chart has his mutual reception of Venus retrograde in Scorpio in the 12th House and Mars in Libra in the 10th House. Venus applies to a conjunction with the Sun, a Square to Jupiter and a Sextile to Neptune. Mars has no applying aspects, but separates from an opposition to Saturn and a Sextile to the Ascendant. Here is someone who rides a seesaw between the Venusian pursuits such as film and Martial pursuits like sports. Which does he enjoy more? It depends on when you ask the question. Multiple dispositors, such as those in my own chart, allow one to see where different houses and planets get their basic energy. For example, the sign on my 3rdHouse cusp is Aries, ruled by Mars in Capricorn, which is ruled by Saturn in Capricorn, its domicile. Mercury is placed in Pisces, ruled by Jupiter, which is placed in its own sign Sagittarius. So we have two points in the chart, both of which deal with the intellect and communication. In my estimation, planets are the verbs (action words) in the chart and the houses the nouns (people, places and things) there is a clear difference. While my thinking and communication is Jupiterian and expansive in its intent and action, many people think the things they see in me when I’m communicating or trying to work out an intellectual problem are Saturnian. There is clear difference between my intent and action and what people perceive I’m trying to do or say. When I’m actually trying to formulate a clear, concise solution to a problem or an answer to a question, some perceive it as me being defensive or controlling. It’s a real difficulty I have relating to people. Only people that I’ve known for a long time or those who instantly “click” into what I’m about (by good synastry between our charts, usually) can pick up my real intent. Mixed dispositor/receptions would be a combination of the above factors. These are just two ways I’ve used essential dignities and the web of rulerships in practice. The can be used extensively in all areas of astrology including natal, horary, electional, vocational, mundane and event analysis. If you aren’t currently using these techniques in your chart work, I heartily suggest you give them a try. Copyright © 2004 by Frank Piechoski, based on material originally published on the Internet by the author in 1996.